Reds boss Danny Wilson opted to make four changes to his starting line-up following the comprehensive defeat at MK Dons last time out a week ago. Wilson drafted much more experience into the XI for this latest tough test, with skipper Martin Cranie, Peter Ramage, Dale Jennings and front-man Kane Hemmings getting the nod. Youngsters George Smith and Alex Kiwomya were dropped to the bench, while George Williams and Luke Berry were out of the 18 altogether as the hosts were desperate to rally from a troubling run which has seen them pick up just three points from four games since Christmas. Striker Sam Winnall was back among the substitutes for the first time since being injured against Scunthorpe in November. As for Vale, who are still just two points shy of the play-off places despite last weekend’s derby defeat at home against Crewe, they made three alterations, and intriguingly Reds target Tom Pope was to make his first start since October following a long-term knee injury. It was a very low key opening quarter of the game at Oakwell as both Barnsley and Port Vale struggled to create meaningful chances. And the flow of the game wasn’t helped by an early facial injury for Vale defender Frederic Veseli, who sustained an unintentional blow from Conor Hourihane and was forced to undergo lengthy treatment. The visitors went close in the opening minute when Ben Williamson’s daisy-cutter forced Ross Turnbull into a smart, low save. The gusty conditions weren’t helping the flow of the game. Milan Lalkovic helped hand Barnsley a precious half-time lead as his stoppage-time effort helped create the opening goal of a dire first half. The Reds’ recently-signed wide-man burst menacingly down the left wing before Vale ‘keeper Chris Neal appeared to palm his low cross into his own net from barely a yard out. The game had livened up a little during the second quarter. Despite the blustery conditions at Oakwell, the Reds stuck to their task of playing neat football. Conor Hourihane saw a shot blocked after playing a tidy one-two with Kane Hemmings, while Peter Ramage saw a looping header tipped over the crossbar by Vale ‘keeper Neal. At the other end, Tom Pope pounced on a loose ball in the Reds’ box, only to scoop a shot over the top from eight yards. Twelve minutes before the break Dale Jennings jinked his way past a couple of meek Vale challenges before lashing in a 30-yard thunderbolt which Neal had to palm away for a corner-kick, which unfortunately came to nothing. Shortly before the half entered seven minutes of added time Vale went close when Frederic Veseli fired over the top from 12 yards. The Reds got themselves off to a dream start to the second half as young loan man Ben Pearson made it 2-0 in the 48th minute. And what a great goal it was. The Manchester United starlet ran purposefully from deep inside his own half before eventually slotting past Chris Neal via a slight deflection off Vale’s former Barnsley defender Carl Dickinson. Minutes later the lead was almost extended when skipper Martin Cranie forced Neal into a smart stop. Vale were reeling at the three-quarter stage of the match, though they did go close to pulling a goal back when Michael O’Connor’s cheeky chip dipped inches over the crossbar. Sub Chris Birchall also went close, but the Reds were in control. The Valiants hit back in the 67th minute. Ex-Red Carl Dickinson swung in a looping cross for Colin Daniel, who volleyed clinically past Ross Turnbull from six yards. The visitors were visibly lifted, and they almost evened it up minutes later when Tom Pope’s thumping header was hacked off the line by Conor Hourihane. The Reds weathered the storm, however, and as the clock began to tick down, Hourihane fired in a venomous 20-yard strike which Neal palmed round the post superbly. Kane Hemmings then came mighty close to a third Reds goal when he screwed an angled shot inches wide with Neal well beaten. Sub Sam Winnall - making his first appearance since November - then tested Neal with a fizzing low drive. However, the gutsy Reds hung on for a deserved three points. 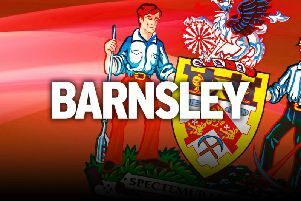 Barnsley (4-4-2): Turnbull; Cranie, M’voto, Ramage, Nyatanga; Lalkovic, Pearson, Hourihane, Jennings; Waring, Hemmings. Subs: Davies, Scowen, Winnall, Digby, Smith, Lita, Kiwomya. Port Vale (4-4-2): Neal; Yates, Veseli, Robertson, Dickinson; Lines, O’Connor, Daniel, Marshall; Pope, Williamson. Subs: Johnson, McGivern, Duffy, Birchall, Brown, Moore, Lloyd.